I was first introduced to the Ka-Bar USMC knife on a police bushcraft and survival training course and it impressed me so much it took me less than a week after the course to go and buy one. It became a knife that was a constant companion on hunting trips and on trips out into the Australian outback whether for work or family fun. On the police training course we had used the Ka-Bar for shelter building, obtaining kindling and just about everything one could think of. Whilst I wouldn’t quite go so far as to say you could cut down a tree with one, you could certainly demolish a decent sapling or two and create a veritable home from home with it. Thus it earned its place on my belt next to a drop point skinning knife and a sharpening steel. There is something about the Ka-Bar that just feels right the first time you pick one up, it’s a something that gets confirmed more and more as you begin using one. You could skin and gut something kangaroo or deer size with one though it is on the big size for that, hence I carried a smaller drop point; but it worked really well for carving up the bigger serves of meat back at camp. You could even do a rabbit with one if you used the method where you cut the skin at the back just behind the shoulder and then remove the fur coat by pulling the two ends off, then gut, and finally slice up into suitable roastable sections. Yes, a stockman’s knife would be better but, in the absence of a stockman’s knife, the Ka-Bar does just fine. The Ka-Bar began its service life with the US Marine Corps in 1942 as a replacement for a stiletto type of issue fighting knife that was then issued. The stiletto had proved to be good for silent killing but had also proved to be unsuited to much of anything else. This is worth considering if you are buying a knife for general purpose camping use. The Sykes-Fairburn double edged knives look appealing in the glass showcase in the shop but that double edge quickly becomes a nuisance when you try to actually use it out camping. This mirrors the marines’ practical experience in those early days of World War II. Even though I’m originally a Brit I’ll happily admit that the Ka-Bar is a vastly superior knife to the Sykes-Fairburn just as John M Browning’s Colt 1911 is a vastly superior pistol than the Webley and Scott automatic of 1912. Just to rub salt into the wound I note that the epitome of Britishness, Sir Winston Churchill, was photographed holding an American Thompson sub-machine gun whilst tastefully smoking a Cuban Romeo and Juliet cigar, not holding a British Sten gun, which has all the romance and character of a short length of water pipe. 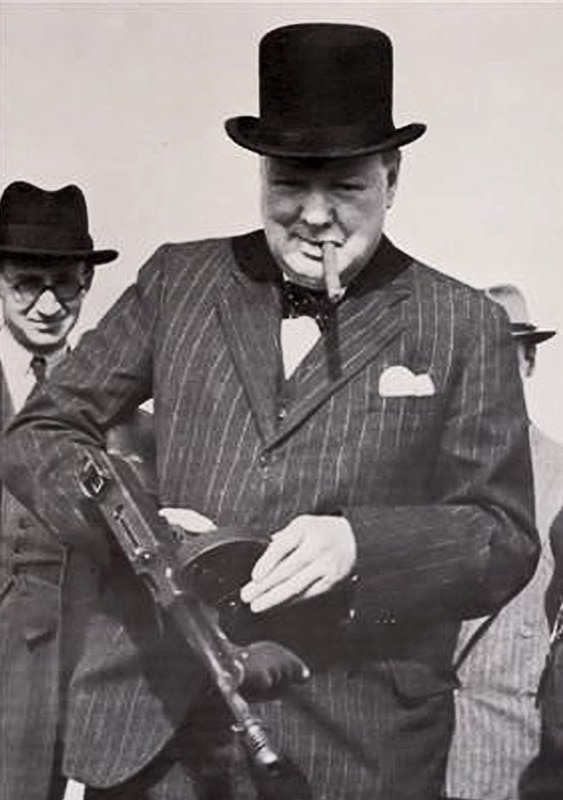 Winston Churchill with Thompson sub-machine gun and Romeo and Juliet cigar. The original name “Ka-Bar” reputedly came from a testimonial letter sent to the Union Cutlery company, the original maker of the knife, from a fur trapper who had used one to kill a bear and wrote to tell the manufacturer about it. The letter was somewhat difficult to read but the words “ka bar” were understood to really mean “kill bear” so the name was adopted and stuck. 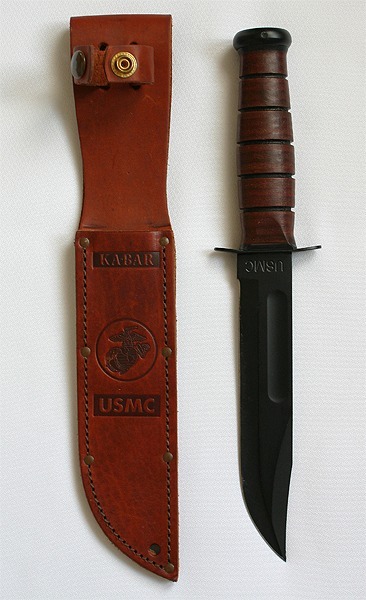 The actual design of the USMC Ka-Bar was influenced by serving marine officers Colonel John M. Davis and Major Howard E. America who worked with Union Cutlery to perfect the knife. The improvements included lengthening the blade to seven inches, using a fuller (groove) to lighten the blade, a stacked leather handle with an effective hammer end to it, a steel cross-guard, and a non reflective matte phosphate finish. The end result was a design that has remained unchanged for decades and which, just like John M Browning’s 1911 pistol, proves that the popular saying “there’s always room for improvement” just isn’t true. The Ka-Bar, you just can’t improve on perfection. If you’d like to own a little piece of history then a genuine Ka-Bar is not an expensive item to buy. Amazon has them. I think you’ll find it becomes a constant companion any time you go camping or hunting.